If you’re curious about Hungarian wines visit the following wine bars in Budapest to get an overall picture what local wines are like. 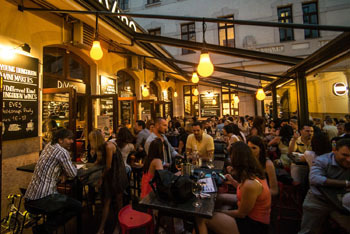 Pest’s city centre has most of the wine bars and shops, but you’ll find some great places in the Buda side too. You most likely will bump into one or more of the wine places listed below while strolling in Pest’s centre. We Hungarians tend to think that our wines belong to the top in the world. The truth is most people outside our country haven’t even heard about Hungarian wines except for maybe the golden-hued, sweet Tokaji aszú and the Egri Bikavér (Bull’s Blood from Eger wine region). of the tourist-packed Váci Street. 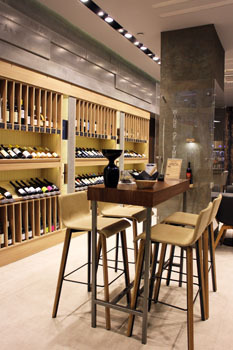 It’s a spacious wine shop with state-of-the-art tasting machines where you can choose from around 50-60 local wines to sample. They often organise special wine events and tastings. Expert sommelier and hands-on applications aid you in finding out more about Hungarian wines, wine making and viticulture. 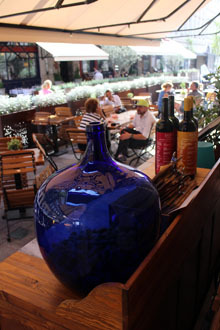 Highly recommended if you wish to get away from the hustle and bustle of Váci utca! The best thing is that here you have the opportunity to choose how much to taste: only a sip from a rare and expensive Tokaj aszú or half a glass from a lighter white. You use an electronic card to pay for the wines. machine will deduct the price. You can top up your card with more money if you want to. It is also possible to try wines you would like to buy. Around 150 bottles are available for purchase with delivery to your home. 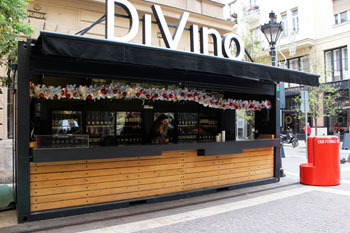 Address: Szent István tér 3., district V.
Divino has two bars in Budapest one at the Basilica on Szt. 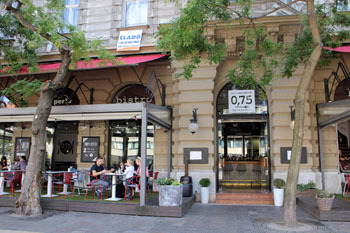 István Square close to 0,75 bistro listed above the other one in the hip Gozsdu Court in District VII. A place where you can meat with aspiring winemakers, members of well-established wine making families. 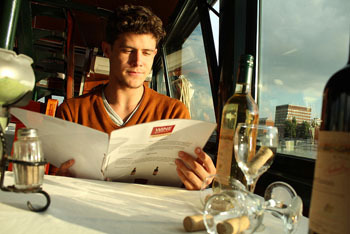 Long wine list with all the well-known wine regions included. Wines are served by the glass, minimum protion is 1.5 dl. Prices range from 600 HUF to 5 000 – 6000 HUF / 1.5 dl (aszú-s, single vineyard selections). Limited selection of food (cheese and ham plates, spreads with homemade bread, salmon, chicken, salads, risotto with spinach and shrimp) for around 1 200 – 4 500 HUF. Knowledgeable, courteous staff who are ready to help you with your wine selection or questions. like the Wine Festival in Buda Castle. 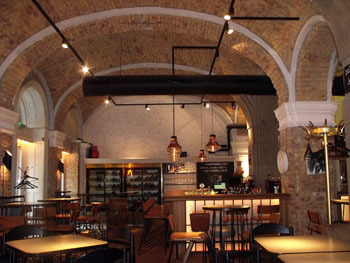 Address: Szent István tér 16., district V.
The owners of Palack Bar in Buda opened the place in 2015 on tourist-packed Szent István Square at the Basilica. As the name suggests 0,75 bistro serves food besides the well-assorted wines thast represent a wide spectrum of domestic wine regions. Except for the two top bottles (Gere Solus from Villány and Szeleshát Nyék), wine sare available by the glass in 1.5 dl portions (price: cc. 600-2000 HUF/1.5 dl). Two Croatian bottles are also worth tasting: a cabernet sauvignon by Korlat and the grasevina by Daruvar. The food is pretty good too n 0,75 bistro. 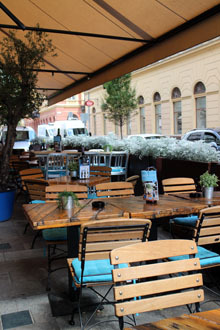 Address: Október 6. utca 9., district V.
A trendy bar and bistro (the name is a word play on the Hungarian “inni jó” that translates to “drinking is good”) in the Basilica neighbourhood with a huge wine list and quite good food from bistro food to tasting menu. Apart from excellent Hungarian bottles, you’ll find a vast choice in wines from abroad including outstanding sparkling wines and champagnes from Champagne. Prices are geared towards tourists. Goulash is 2 000 HUF. Warm inetrior with beige brick covered, arcaded walls. Service is iffy. Some say they were 100% satisfied with it while others complained on slow service and rudeness. Anyway it’s worth a try while roaming in downtown. 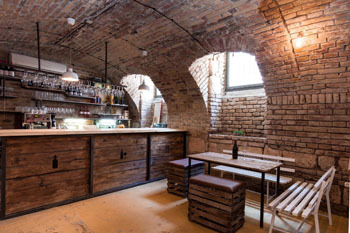 Address: Arany János utca 12., district V.
The bar is owned by Gianni Annoni, a gastro entepreneur living in Budapest (also by him: Trattoria Pomo D’oro across from DOC and Gelateria Pomo D’oro) a few metres up the street toward the Basilica. This laid-back wine spot trying to introduce wines of Italy through around 120 bottles. Besides wines, spirits and liqueurs are also available. If you feel like having something to eat Italian-style ham and cheese platters and anti pastis are the choice. Nice, shaded terrace on the street to sit around in fine weather. A great central venue close to all the important attractions (Basilica, Danube, Chain Bridge). 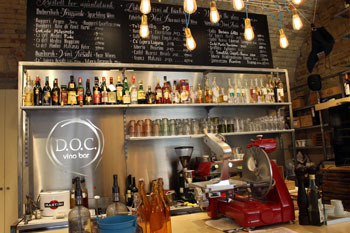 Although it’s not a wine bar but Wines n’ Roses next to DOC Bar deserves to be put in this list. It has some fine wines at favourable price from the small wine growing region of Mór (cc. 100 km west of Budapest) and by one of the country’s emerging wine maker, Csabi Miklós. Lovely flower arrangements and bouquets too. Address: Aulich utca 7., district V.
cakes to go with it. You can go upstairs to savor your drink or seat outside on the small cushioned terrace seats in good weather. In Pohaárszék you can also have daily lunch of 2 courses for only 1 200 HUF (less than 3 EUR). The kind, friendly staff is ready to help you select a wine. Address: Balassi Bálint utca 27., district V.
Drop Shop is located in the centre within a short walk to the Parliament and Jászai Mari Square (Grand Boulevard/Nagykörút). The spacious, clean, contemporary design is the work of the interior designer couple, Sütő. The bar chairs are not too comfy though. a very professional and knowledgeable staff who will tell you everything about the wines you’re interested in. Tasty plates of cheese, salamis and olives to go with your wine. 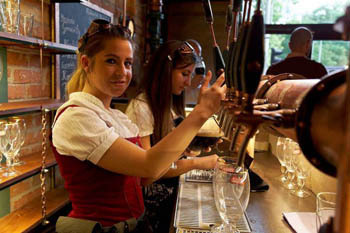 Address: Károlyi utca 11., district V.
Judy’s Bar is inside the Hotel Erzsébet City Center in downtown Budapest. It’s a lovely spot with a nice choice of wine that can be bough by the bottle. Selection includes Hungarian wines both by well-known and emerging wineries. Wines from abroad can also be sampled at Judy’s. There’s tapas if ou want to eat something to soak up all the alcohol. The staff will give you advice on what to taste if you’re confused by the offer. Address: Király utca 13., district VII. 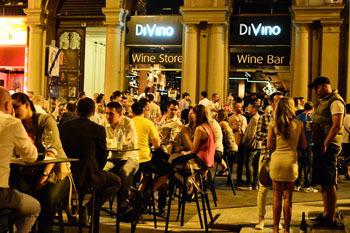 Following the success at he Basilica, in 2014 the owners decided to open another DiVino Bar in the hip Gozsdu Court a bar-and-bistro- backed arcaded courtyard in the historic Jewish Quarter. The spacious terrace is usually full from spring till autumn. Here you can savour you glass selected from the 120 wines on the menu, mainly by the members of the Junibor Association of young generation of Hungarian winemakers. young start-uppers (Tomi Kiss, Gábor Kiss) as well as with those who established their wineries fame and brand on their own (csabi Sebestyén, Jani Bolyki, Gábor kardos, Csabi Miklós). a very exciting cuvée by Gábor Kiss: Rouge 52 2013.
aszús (6 puttony by Demeter, another 6 puttony by Árvay Winery) and szamorodnis. 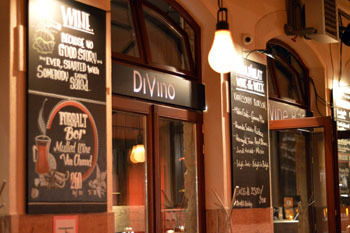 The food menu is not long but DiVino is more focused on wine drinking than eating. Prices: wines: the smallest volume is 1.5 dl in wines that starts from 600 – 700 HUF (Frittman irsai olivér, Bolyki Indián nyár, Dúzsi rose) with the most expensive items (Gere Solus, Szent Tamás furmint reaching 3 500 – 6 000 HUF/1.5 dl. Foods: around 1 000 – 3 800 HUF. Professional, kind service. It’s a lively, youthful place ideal for a chat by a glas sof wine. Address: Király utca 39., district VII. Address: Király utca 42., district VII. Kadarka, named after a Hungarian grape variety is locat d in the popular Király Street of Pest’s 7th district. All of them are availably by the glass in 1,5 dl or 0,7 dl if you plan to try several wines. lesser-known wine makers: Nyolcas-Eger, Havas és Tímár-Eger, Planina-Mohács, Halmosi-Szekszárd. Another must-try is the fröccs (spritzen: a blend of wine and soda water, various ratios are used) especially on hot sumemr days. Address: Dob utca 20., district VII. One of the most beautiful wine bars of the city stands at the corner of Dob Street and Holló Street in the Jewish Quarter. 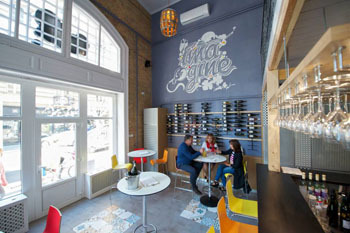 Képzeld el Wine Bar – Imagine! Address: Wesselényi utca 23., district VII. A small but relaxed place with cheery atmosphere at the corner of Wesselényi and Nagy Diófa Streets in the centre of the Jewish district. Two sitting and one standing table but there’s a tiny terrace overlooking the street. 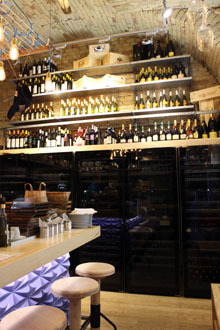 Wines by less known Hungarian wine makers make up the majority of the wine list with some Italian choices thrown in (prosecco, bio prosecco by Valdobbiadene DOCG Brut Biologico). It’s possible to have only a little bit – 0,5 dl – if you’re unsure about a wine though the staff (two of them are the owners) is extremely helpful. The small portion is also fitting if you want to sample more wines. but other prominent areas are also represented: Eger, Villány, Szekszárd. No cooked food but top quality wine snacks: craft cheeses, sandwiches. Youngsters and middle-aged business mingle well here in the afternoons and at night. Perfect for a spontaneous wine tasting session, meeting with friends or warming up for a party in one of the nearby clubs, ruin bars. Prices: 300 – 650 HUF/0,5 dl, some big name wines: 600-800 HUF/0,5 dl. Prices of 1.5 dl glasses start from around 600 HUF. Some heavier reds cost 1 500 HUF per 1.5 dl. Address: Tűzoltó utca 22., district IX. It roughly translates to: You can drink wine after beer anytime, but you’ll suffer if you do it the other way round. The place is specializing in Hungarian craft wines so this is the place if you’re looking for some unusual fine bottles. The offer is constantly renewed with fresh, new wines added to the menu. Prices are very friendly. You can get 0,5 dl glass for 200 HUF, while 1,5 dl glasses start from 600 HUF. There’s a pop-up fröccs/spritzen (wine with soda water) terrace on the upper floor with a different offer than available in the bar with new wines and wine makers introduced each month. A nice place to sip a a glass or two fröccs on hot summer evenings! 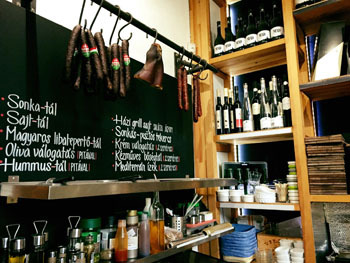 Permanent and daily tapas offer from local ingredients bought fresh from the market so besides the usual cheese-olives-sausages, you can savour some creative bites: dusk liver patée, confit pork rib, grilled cheese on salad bed. GasztoPlacc farmers’ market on Sundays. 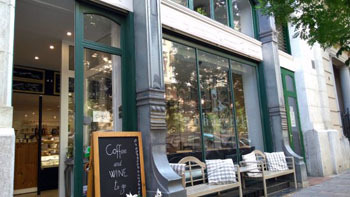 The place behind Corvin Plaza combines two of the best things in life: wine and chocolate. In vinoWonka both are high-quality, hand-crafted products. delicious bonbons and truffles by the top chocolatiers of Hungary: Harrer from Sorpron, Pelle-Molnár handcrafted bonbons (oroszlány town), Bolka (Budapest) etc. A great number of wines are available by 1 dl glass. Prices around 320 – 1 000 HUF/dl. Simple bar food: sandwiches, cold plates with cheese and salamis, olives are alos offered. Nice terrace to sit around and watch life on the promenade. The choice is less in the Buda side of the city but here are 3 favourites. Address: Lövőház utca 14., district II. 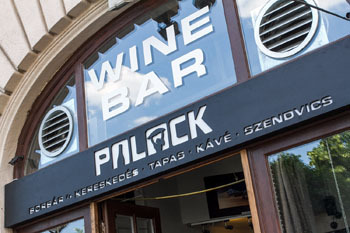 Szalonspicc was the first wine bar in Buda that opened in 2012 in the pedestrian Lövőház Street. 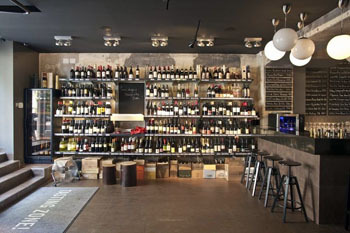 They carry around 60 local and international wines and 15 champagnes and sparkling wines. The minimum volume is 1,5 dl from whites, roses and reds and 1 dl from dessert wines and champagnes. dry whites: 890-1 900 HUF/1,5 dl. desserts (chocolate fondant: 990 HUF and American style pancakes: 1 250 HUF) prices between 850 – 2 200. Good wine selection, knowledgeable wine recommendations and friendly service. Delicious snacks, tastefully served. An excellent choice for light dinner, or just sipping wines. A pleasant place to sit around, especially on the terrace in fine weather. Address: Szent Gellért tér 3., district XI. Palack offers a scenic view of the Szabadság bridge, the Danube and the Pest side. The bar carries 80-100 wines from smaller but value-oriented Hungarian wineries that are available by the glass or bottle to take away. The wine menu is very similar to that of 0,75 bistro though here wines are grouped according to type (light whites, roses, full-bodied whites, light reds, full-bodied reds, dessert wines etc.) not growing region. 1,5 dl is the smallest portion but you can ask to split in two if you plan to taste more wines. TIP: Tour of Wine Bars in Budapest – an afternoon event in either June or July when you can hop from place to place to meet wine makers and sample their offer. Where to taste wines in Budapest? Faust Cellar Buda Castle offers several tasting lists.